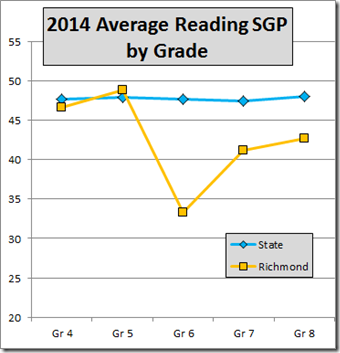 VDOE has provided Brian Davison a third set of SGP data. 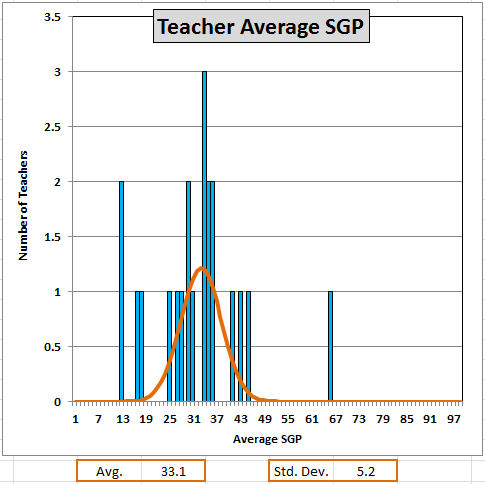 This set includes (anonymized) teacher IDs. 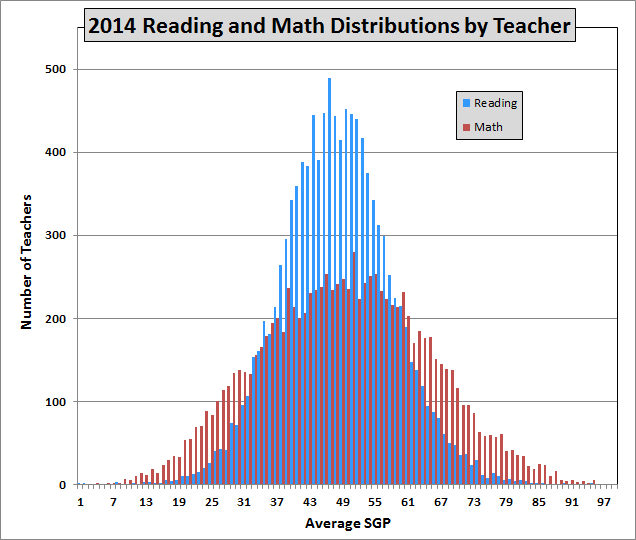 That last point is particularly important: The SOL is significantly affected by the student’s economic status; poorer students generally get lower scores. 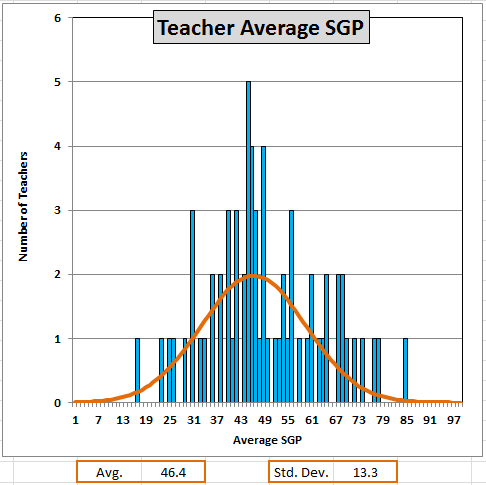 The SGP, in contrast, measures improvement relative to similarly situated students; the SGP ranking is pretty much independent of economic status. 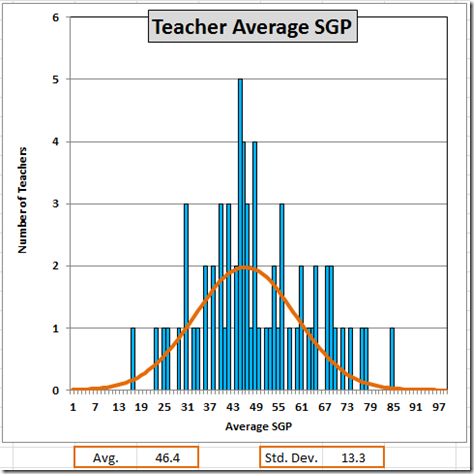 Thus, the SGP gives us a measure of quality that allows comparisons from division to division, school to school, and teacher to teacher. VDOE gave us anonymized teacher IDs, but not the names of the teachers involved. 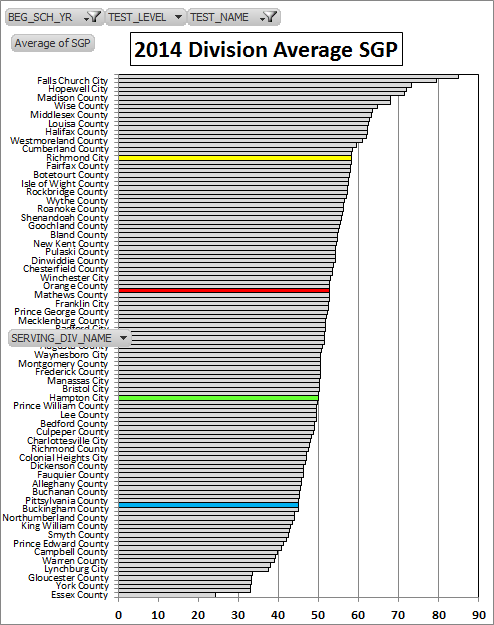 More on this outrage in a later post. 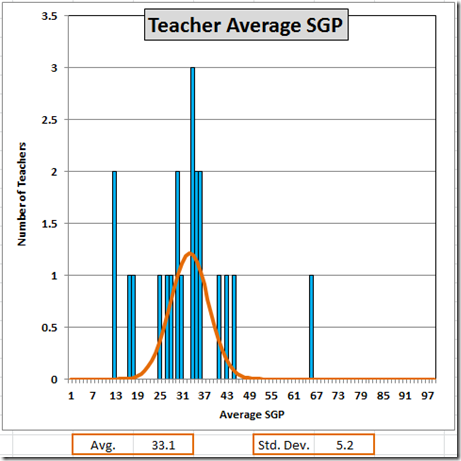 The SGP is calculated from the difference between similarly sized SOL scores, which can lead to large relative errors in the SGP. 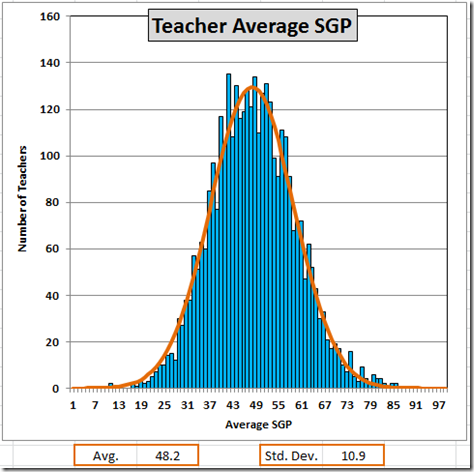 This suggests considerable caution in interpreting any individual student’s SGP score or the average (or distribution) for a teacher where the number of scores is small. 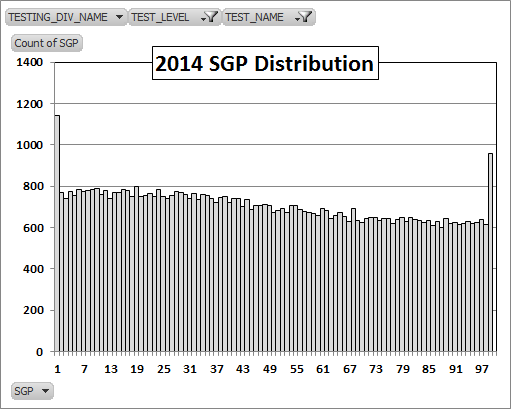 That said, here is the distribution of 2014 division average Reading SGPs. 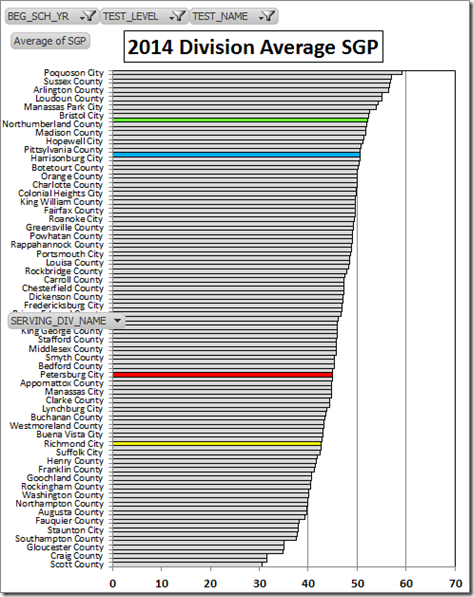 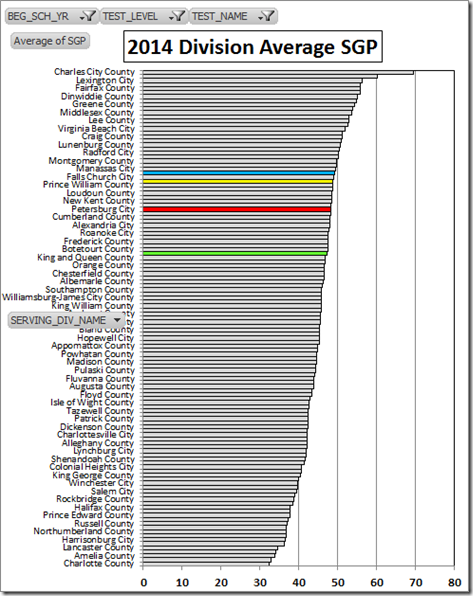 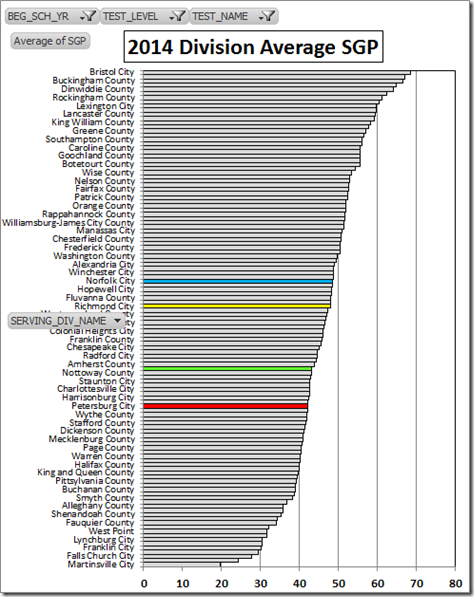 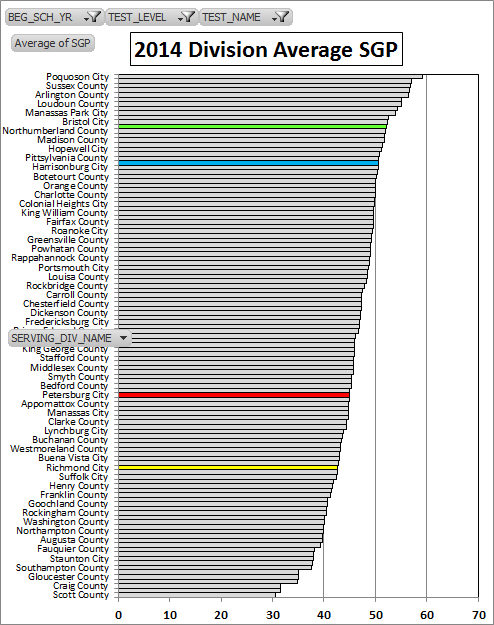 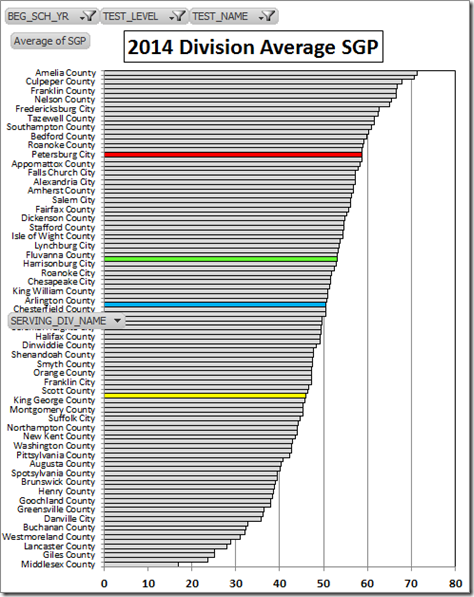 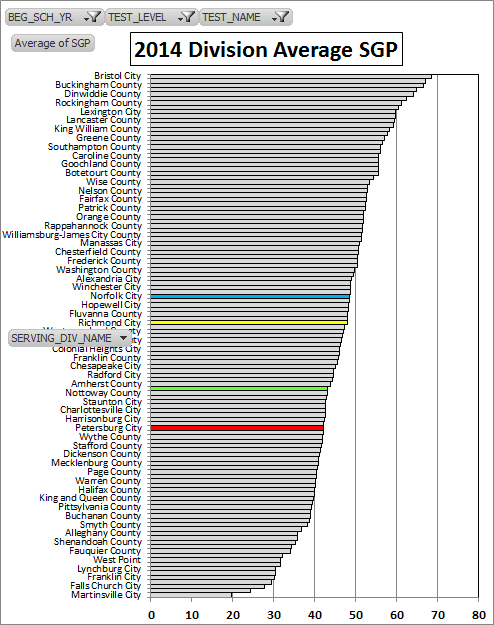 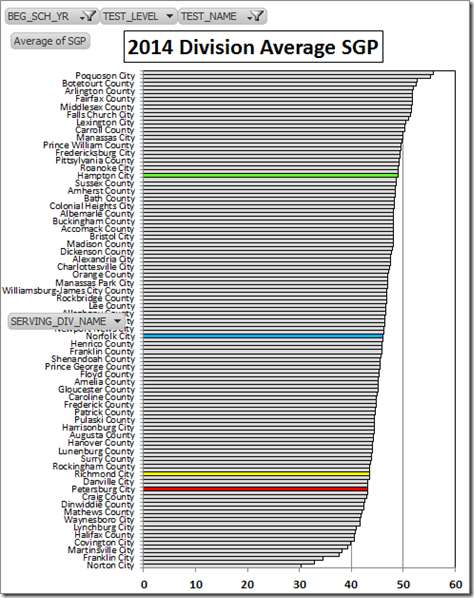 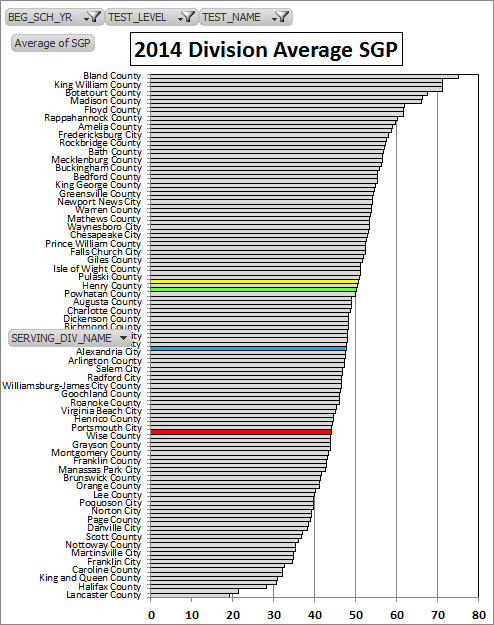 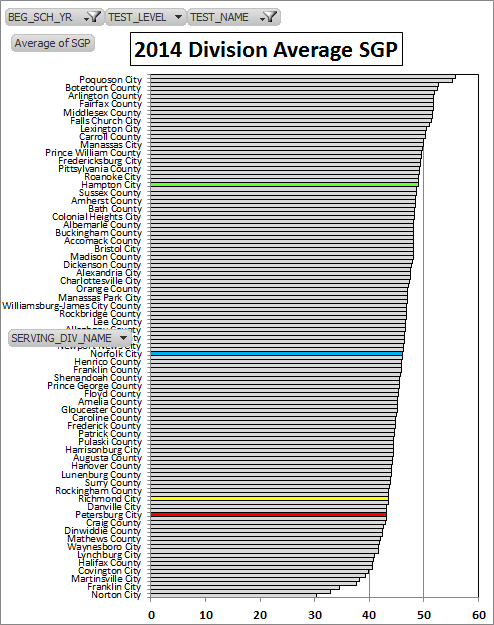 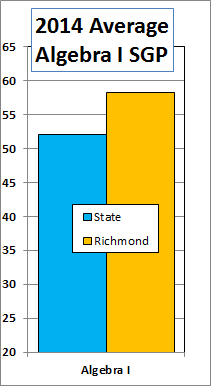 On this graph, and those below, Richmond is the yellow bar, Petersburg is red, Norfolk is blue, and Hampton is green. 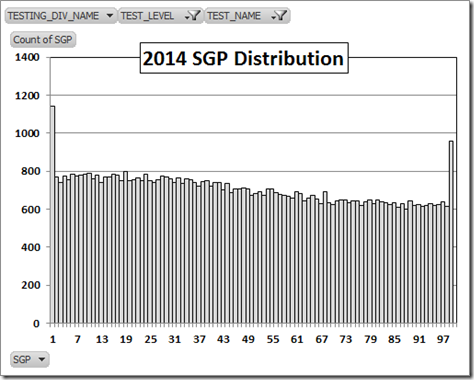 Excel is unable to readably list all the divisions on this graph; the list here and below excludes every 2d division. 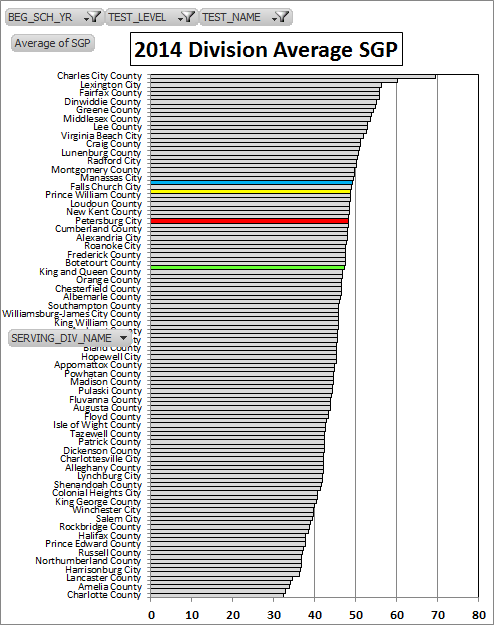 Thus, on the graph below, the blue bar (Norfolk) appears between Surry and Essex Counties. 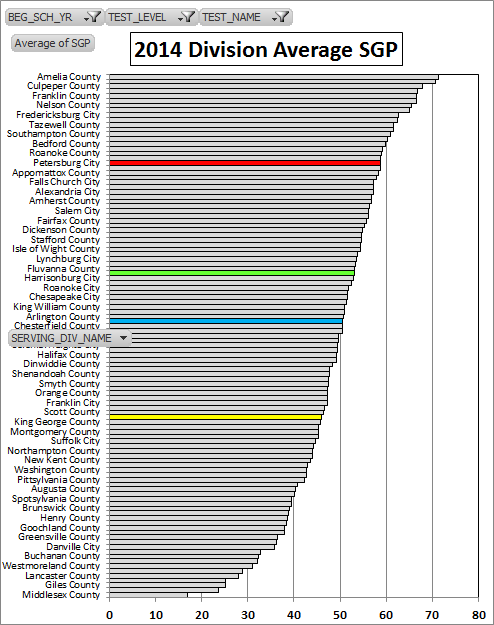 That’s just an artifact of the program, not evidence that Norfolk has disappeared. 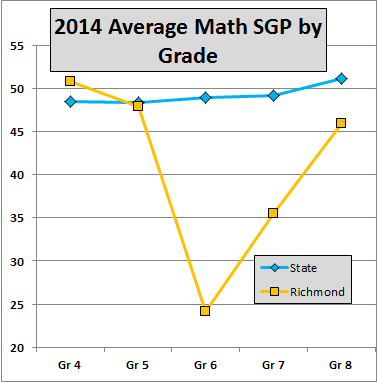 These graphs show a distressing pattern that we will see repeated in the math graphs: Richmond does an average or better job in the elementary schools and a particularly awful job in the middle schools. 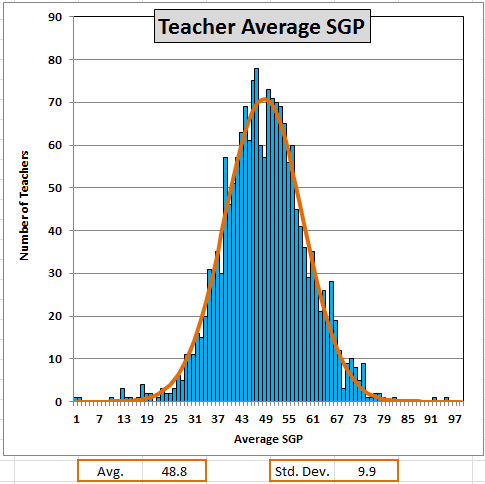 Note here the drop from a better-than-average 49 in the fifth grade to a third-from-the-bottom 33 in the sixth. 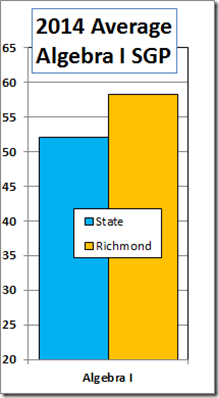 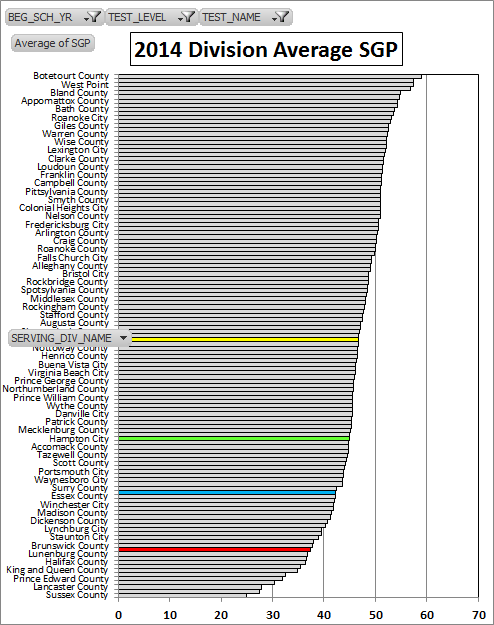 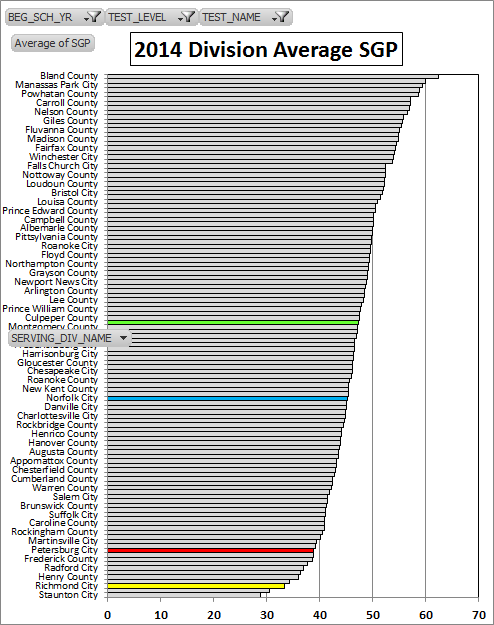 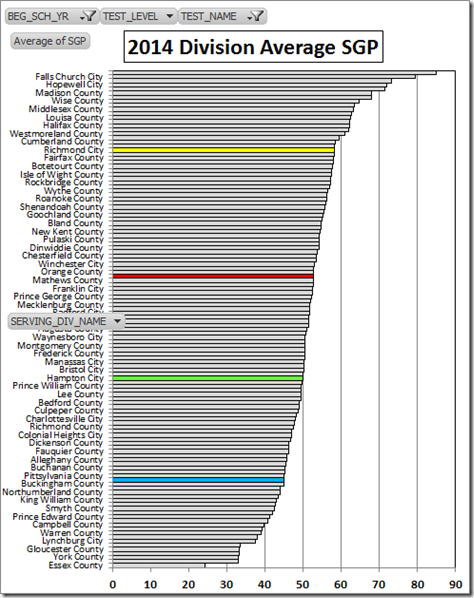 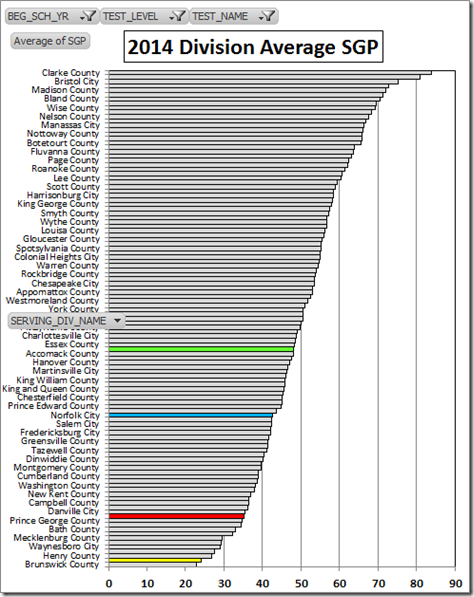 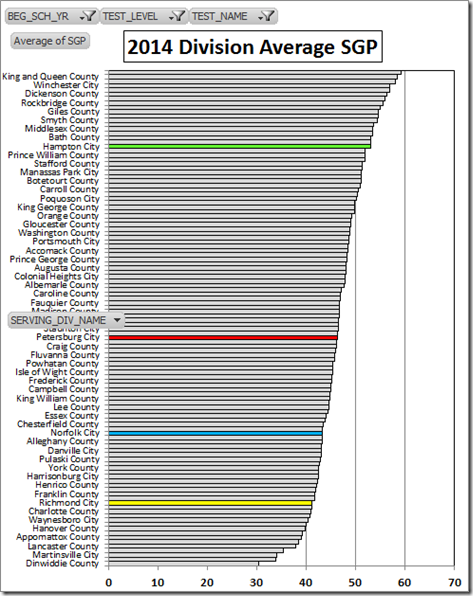 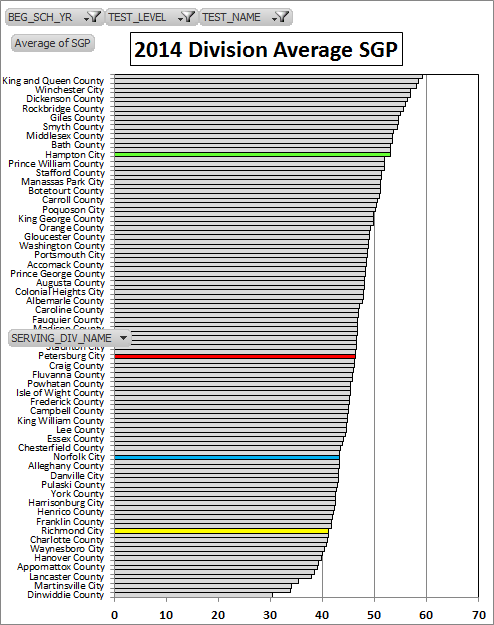 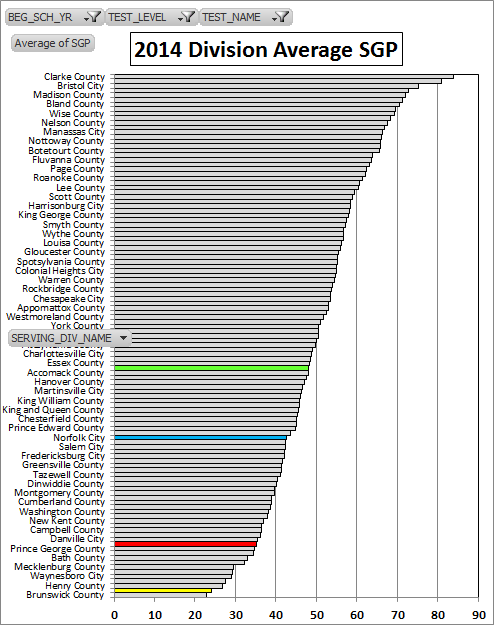 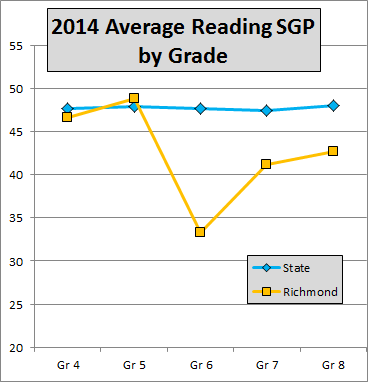 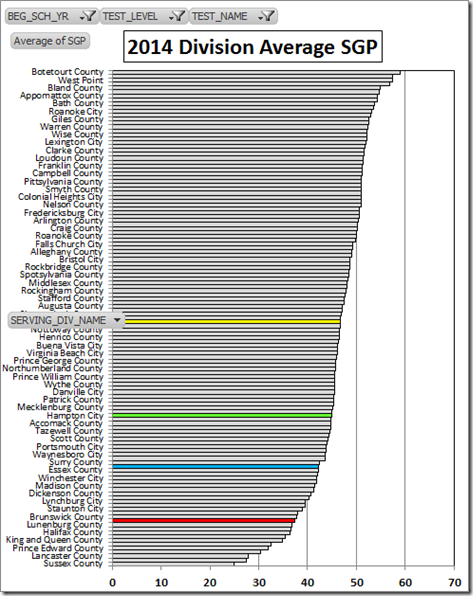 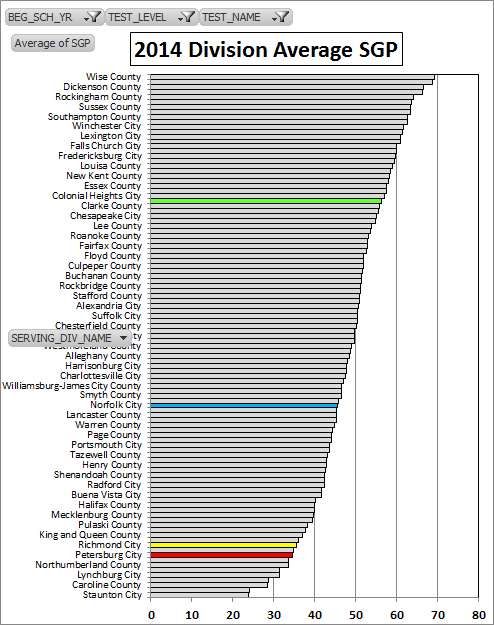 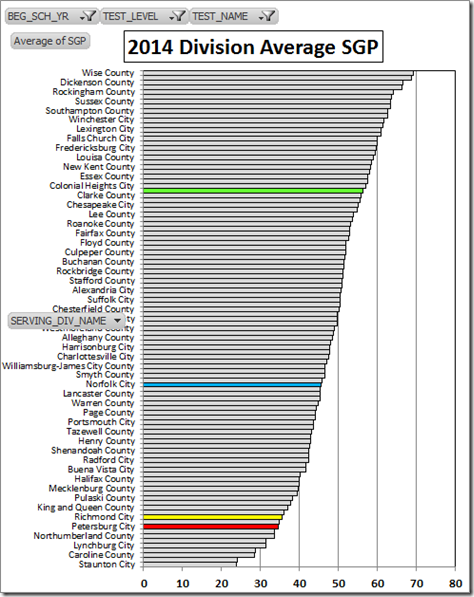 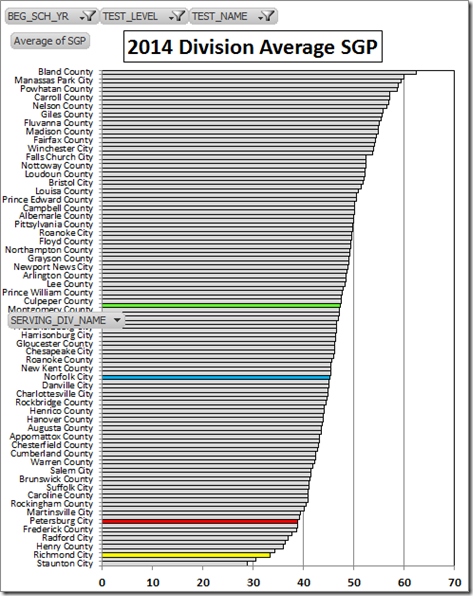 In summary, here are the 2014 Richmond reading averages by grade v. the state. 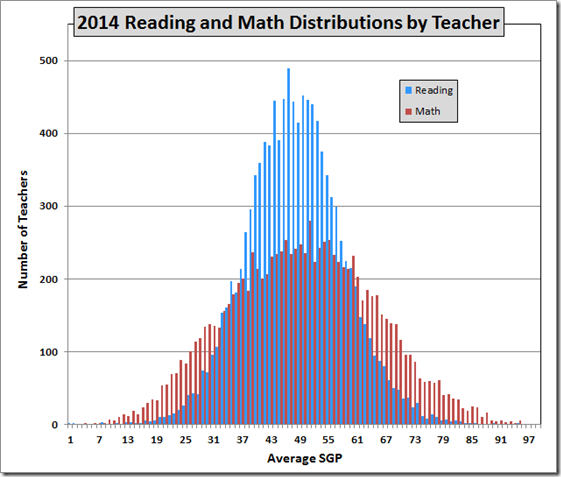 These data don’t tell us why our middle schools are doing such an awful job. 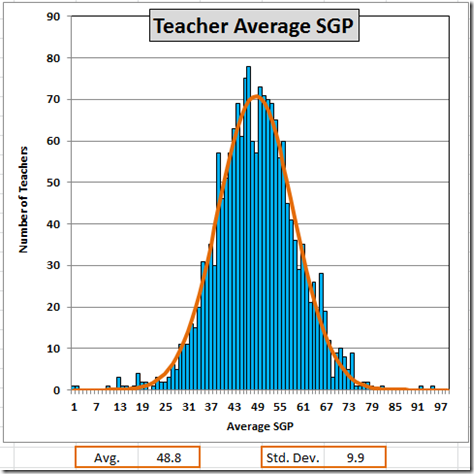 But they (in conjunction with the data by teacher – stay tuned for a later post) certainly tell us where the system is in dire need of repair. 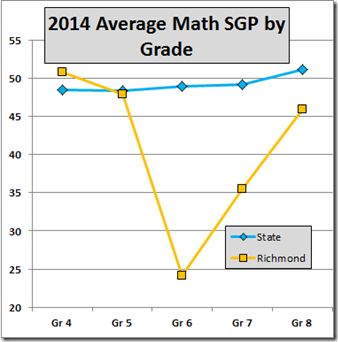 Next post: Math SGPs by division.